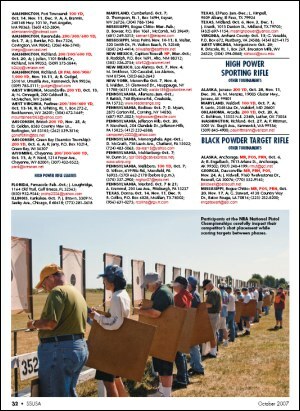 A detailed, 13-page event calendar covering all NRA shooting disciplines is available free from the NRA. This includes all sanctioned NRA matches from October 2007 through December 2008. The “Coming Events” document covers High Power Rifle, Silhouette Rifle, Black-Powder Cartridge Rifle, Smallbore Rifle, Air Rifle, plus a wide variety of pistol disciplines. This handy resource provides match dates, locations, and contact information well into 2008. You’ll find all the major national events, plus state championships and most regional competitions. CLICK HERE to download the 13-page (1.5 megabyte) Adobe Acrobat file. You can also find updated info on NRA-sanctioned matches at the Shooting Sports USA website. 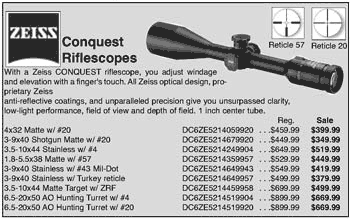 Share the post "Download Comprehensive 07-08 Match Schedule From NRA"
Natchez Shooters Supply, is now offering a wide selection of quality Zeiss Conquest scopes at deeply discounted prices. The Zeiss Conquest 6-20×50 scope is one of our favorite 1″-diameter optics for target shooting and varminting. Natchez is now selling the 6.5-20 Conquest with lower (hunting) turrets at $669.99. That’s a great deal–over $200.00 less than most retailers charge. Zeiss Conquests have clear, sharp optics and very positive windage and elevation adjustments. Contact Natchez soon — availability of discounted scopes is limited. Share the post "Zeiss Conquest Scopes on Sale at Natchez"